Going through a divorce can be an extremely stressful, confusing and an overwhelming experience that can put people in an utter state of emotional turmoil. The mission of the upcoming Battle Free Divorce Virtual Summit (February 4 – February 8, 2019) is to impart the attendees with tools and strategies to help them navigate divorce with clarity, sanity and sensibility, while safeguarding the welfare of children. 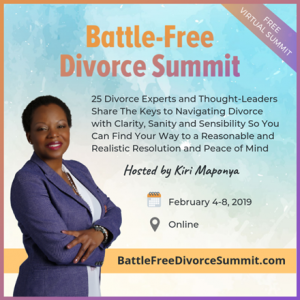 The Summit’s host, Kiri Mapoyana, Certified Divorce Coach and founder of Battle Free Divorce, will be interviewing 25 divorce experts and thought leaders who will share their expertise and insight on how people can more successfully navigate through divorce with ease and grace. Viewers simply have to register for the virtual Summit via www.battlefreedivorcesummit.com. Each video will be available for free for 48 hours. After that, an All Access Pass can be purchased for $67, which gives viewers lifetime access to the videos, downloadable audio versions of the files and a bonus free consultation call with Kiri herself.